Chairman: Tom Doyle 087 9110555. The Veteran Players group have a challenging programme of activities for 2016, which will include, a series of public talks, a very interesting competition for the sports enthusiast, another publication, but most significantly a commemorative event for the centenary of the 1916 rising. The project has already been approved for state funding and focuses on a local participant in the events of 1916. If anyone has any information or views that they feel would be relevant to our commemoration ceremonies, please contact a member of the committee Full details of the commemoration events will be published early in the new year. The Clonegal/Kildavin Veteran Players Group was formed in May 2013 to organise a celebration of the 50th anniversary of the first of the winning of Under 14 schools Gaelic Games County Championship. 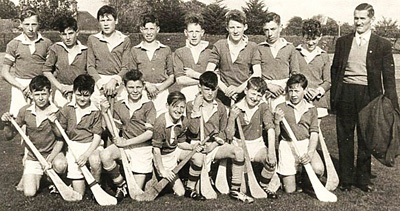 The combined schools of Clonegal, Kildavin and Parkbridge won both Hurling and Football titles in 1963 under the management of Clonegal School principal Ben Mulhall. In the following years 1964,65,66,67, and 68 the combined schools went on to win three huring and three football titles. This Golden era was celebrated at a function in the Talbot Hotel Carlow on 19th of October 2013. The group were so overwhelmed with the support it received for this venture that the project ended with surplus funds. It decided to remain together, with the intention of trying to develop community activity. Provide printing equipment to reduce printing costs to a number of local organisations. It has supported the promotion of participation in Gaelic Games in the local schools. It has run a second Drama Summer School. Launched a second book (1st November 2014) "A Backward Glance" following the success of an earlier one "Lest We Forget", both of which harvested the lived experiences of older members of the community. In February of 2015, the group celebrated a Golden Decade in Camogie, again at under 14 level, including one All Ireland title won in 1995. Following the celebrations a number of the former players have re-formed an adult Camogie Club in Kildavin. In October 2015, the group mounted an exhibition of old photographs and documents and in November 2015 in collaboration with the Ben Mulhall Memorial Park Association and the Kildavin/Clonegal GAA Club facilitated the creation of a memory wall at both locations. Details can be obtained from any member of the committee.